All Avesta residents who are enrolling in a post-secondary program* within the next 12 months are eligible to apply for a $1,000 scholarship. Eligible programs include college, graduate school, trade school, and certificate programs. If English is not your first language and you prefer to write your responses in your first language, please do so. We accept applications in all languages! Selection of scholarship awardees will be made at the discretion of Avesta Housing. Winners will be notified by May 28. Scholarships in the amount of $1,000 (not to exceed tuition and essential class supplies) will be paid directly to the educational institution. Applications of students currently enrolled in post-secondary programs are welcome. 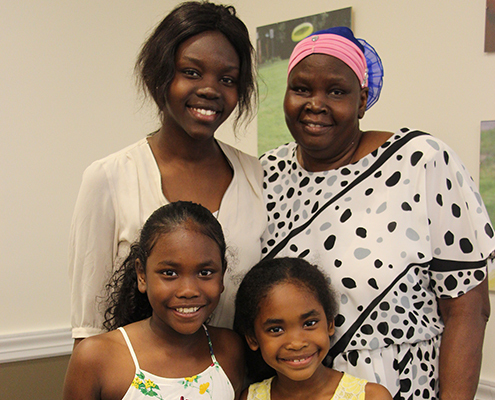 2017 Avesta Educational Scholarship recipient Dina Malual pictured here with her mother and nieces. All applications are due May 15! Please note: there will be a reception for scholarship recipient(s) on June 12. 2017 Avesta Educational Scholarship recipient Pamela Mukiza. 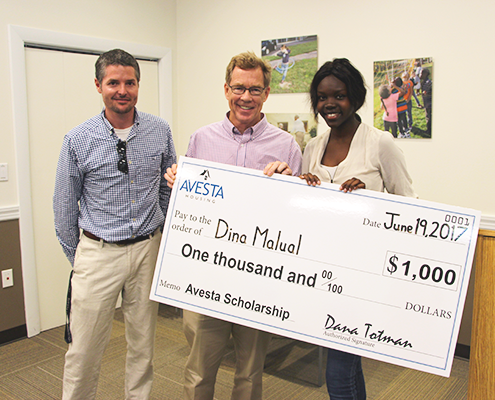 Avesta Housing Resident Service Coordinator Nick Kjeldgaard and Avesta Housing President & CEO Dana Totman present Dina Malual with a $1,000 scholarship.